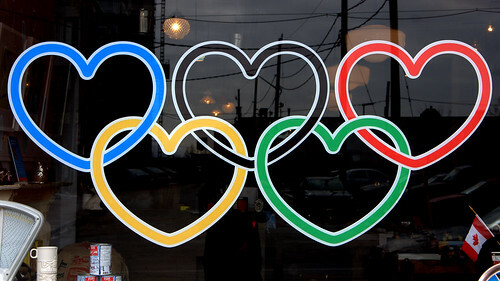 I’m pretty much obsessed with the Olympics. I love everything about it – the stories of perseverance, the hope of becoming a national champion and some kids hero, the grace of some events and the intensity of others, the camaraderie, the rivalries. I even love the fashion. The other night though as I was listening to a segment about the history of the games and how events had evolved and new games had replaced old ones, I thought it might be time for another round of modernization. My mind started spinning with potential additions: snow biking, rollerdancing and it dawned on me that if we treated relationships like an Olympic sport, we’d all be a lot better at it. Think about it. We wouldn’t settle for anything less than a GOLD medal in our relationship. If we lost we would use the loss as inspiration to go out and play harder, not an excuse to take a break. We'd be encouraged by our fans (i.e our friends and family). We'd all have dating coaches. And we would work tirelessly to get the gold… never giving up, never accepting “good enough”. Flirting would be the warm up. You'd do it every day. You'd flirt with your local barista, your office mail clerk, the bartender, etc. You'd make flirting a healthy habit so that when its game on, you'd land every wink, every smile, every laugh, every soft touch on the arm, every charming story and so on effortlessly like a triple axle that has been practiced a million times. Thanks to Lori Gottlieb’s book, Marry Him, there has been a lot of chatter about if you should settle for Mr. Good Enough. (If you have read MENu Dating, you know where I stand on being picky - Need a refresher? Read pages 168-169). Well if you are the type of girl who is happy with a bronze medal, by all means, settle. But when you wake up next to that bronze medal every morning, chances are that you’ll wonder what might have happened, what love might have come your way, if you warmed up a little more, trained a little harder… and believed enough in yourself to go for the GOLD.